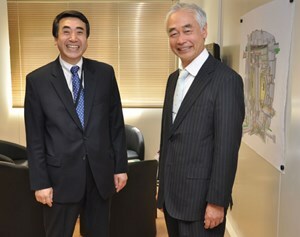 Jooh-Hyun Lee, the president of the Korean Institute of Energy Technology Evaluation and Planning (KETEP) met with DG Osamu Motojima at ITER Headquarters on Friday. The last time Jooh-Hyun Lee visited the ITER site, some five years ago, the most conspicuous feature on the platform was a flagpole marking the location of the future ITER Tokamak. This Friday, the President of the Korean Institute of Energy Technology Evaluation and Planning (KETEP) was back at ITER to meet Director-General Osamu Motojima, "look at construction progress, and encourage the Korean staff working here." KETEP is an agency that was established two years ago by the Korean government for the purpose of developing R&D strategies and programs in innovative energy technologies. President Jooh-Hyun Lee considers fusion as a "realistic energy source for the future" and discussed "concrete ways of supporting ITER" with Director-General Motojima.